Potential buyers are circling multiple Grand Traverse County properties following public discussions of selling off county parcels and parks to pay down the county’s pension debt. County Administrator Tom Menzel tells The Ticker he plans to bring bids for at least one county property to commissioners for consideration at their June 7 meeting. The parcel in question, often referred to as the “Sand Lakes Road property,” consists of 160 undeveloped acres of land in Whitewater Township (pictured). Commissioners last year approved declaring the property surplus and listing it on the market. The $250,000 listing recently attracted two bids, according to Menzel. According to Wolff, the property is a “really important recreational area” that is surrounded on all sides by 20,000 acres of state forest. Multiple trails and trail events run through the site, including the Traverse City to Kalkaska trail and the Iceman Cometh Challenge. The land provides public access to Bullhead Lake, mixed deciduous forest and crucial wildlife habitat, according to Wolff. 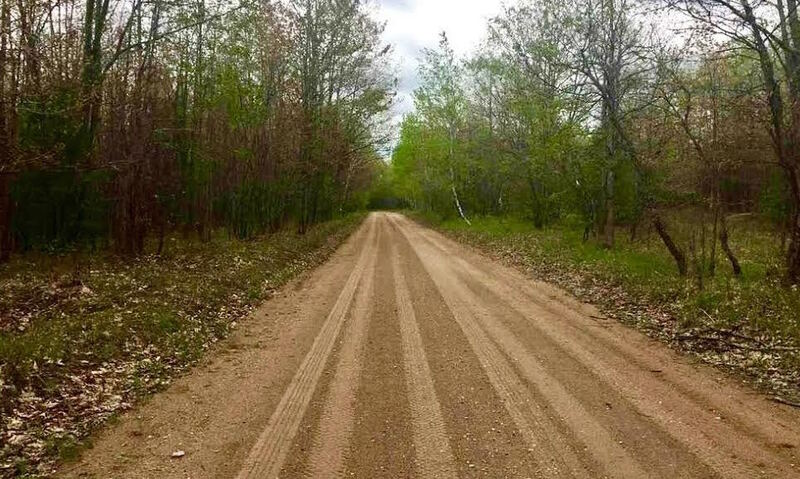 He says GTRLC could potentially buy the property as an inholding to protect the site for public recreational use, with the long-term goal of transferring it to the Michigan Department of Natural Resources (DNR). Another property approved by commissioners to go on the market has also attracted interest. Petoskey business owner Robert Drost made a $400,000 offer earlier this year on three dozen acres of vacant land at the southeast corner of Keystone and Birmley roads. Drost planned to open a landscaping business at the site. The offer was put on hold after commissioners decided to first draft a detailed county policy for buying and selling property before proceeding with any sales. Further staff review revealed the need to shrink the parcel from 36 to 30 acres in order to protect county access to the adjacent Keystone Soccer Complex. Derenzy says she expects a revised bid for the property to go to commissioners in the next 30 to 40 days. Meanwhile, commissioners’ stated desire to explore possibly listing other properties for sale – including high-profile parks like Power Island and the Civic Center – have perked officials' ears in neighboring municipalities. Traverse City Manager Marty Colburn told The Ticker he recently met with county officials for general discussions about the Civic Center, while Peninsula Township Supervisor Rob Manigold reached out to Menzel after hearing talk of selling Power Island. Manigold says he and Peninsula Township trustees have invited Menzel and County Planning Director John Sych to attend a meeting to discuss options for the park. One of those could include the possibility of transferring ownership from the county to Peninsula Township. Manigold says he’s researching easement restrictions on the park’s deed to see if that option is possible, noting the township is only in a “fact-finding” stage and that all discussions are preliminary. Going forward, Wolff says GTRLC has offered to work with county officials to review the county’s complete inventory of properties to identify potential options for various parcels. “What are the potential opportunities from a conservation standpoint? What are the economically viable opportunities?” says Wolff. “We've offered to sit down and look through the list from that perspective."